I made this banner/bunting yesterday and thought I'd show you a quick step by step tutorial in case you would like to make one for yourself! 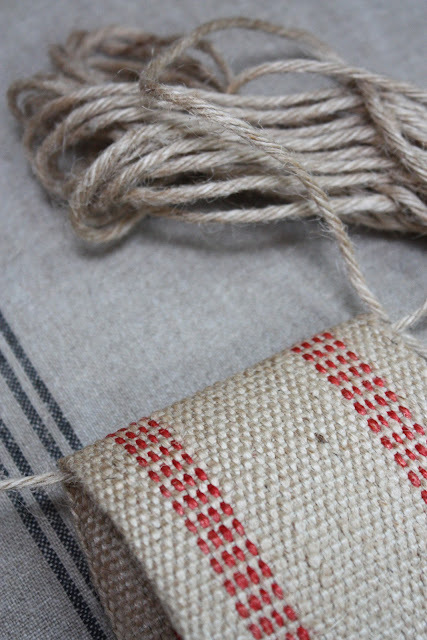 Start with this jute webbing. I bought mine at Joanne Fabrics. I have seen it at Walmart as well. on the length you want to end up with. 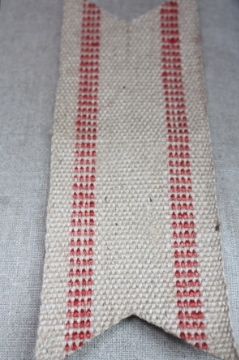 Cut the jute webbing into 10" strips and fold in half. Using sharp scissors, cut a notch out of the material to form this shape. Make sure both ends match perfectly. You can do this by cutting one side, then folding it over and using the cut side as a guide. 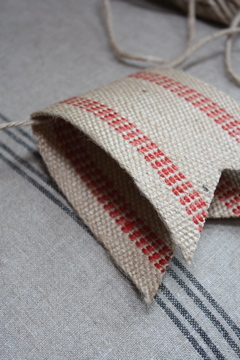 Once you have all your strips cut, take one and fold in half over a piece of garden twine. 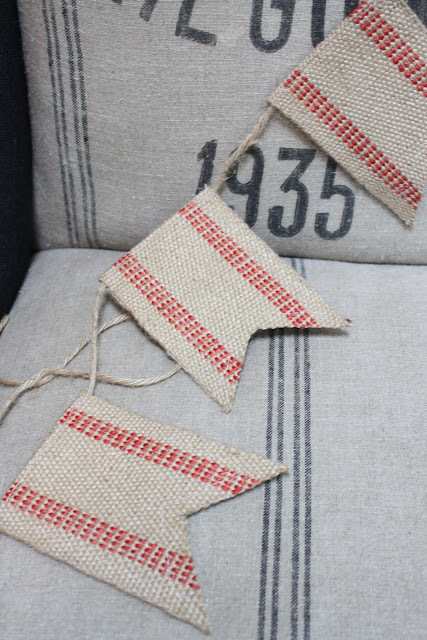 Leave a "tail" with the twine at the beginning and the end so you can hang the banner up easily later. you just might pay a little more. Start off by sewing the folded side of the material. By doing so you are attaching the twine to the webbing. Then stitch around the whole piece, and trim off excess threads. You may need to pin it together to hold in place while you are sewing. 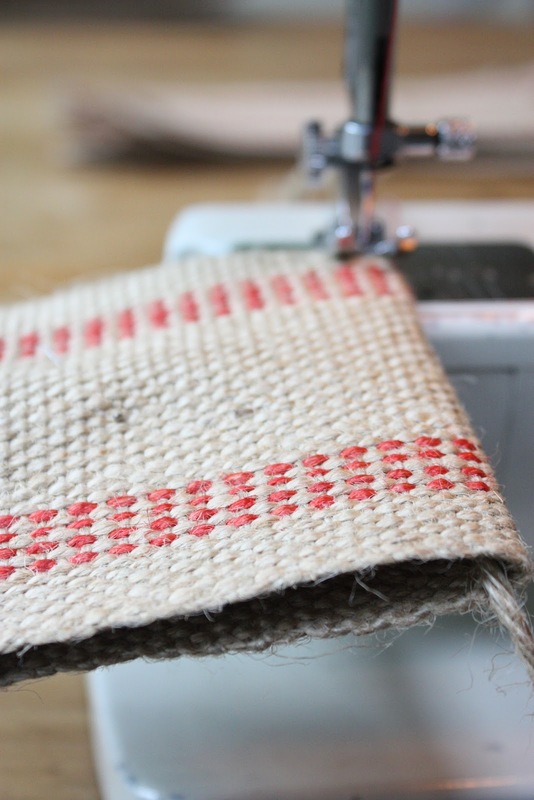 I used red thread and cream bobbin, so that when it is done you can choose to hang it with the red stitching showing, or flip it over for a more neutral look. 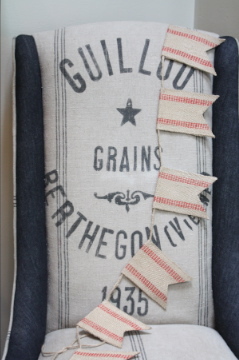 I used 7 pieces of the jute webbing for each banner. Each banner measures around 9' long, end to end. Also, App Smitten is giving away a $50.00 gift card to Amazon! And don't forget to enter the giveaway below. 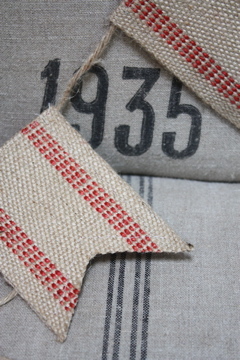 I have the roll of twine, but did you say that the burlap with red stripes material came from walmart and Joann's? p.s. print a Joanne's coupon before you go and you'll really get it cheap! Cute, cute, cute!! I love it!! May have to try it! This is one of my favorite banner ideas ever! this is great. i've seen lots of bunting, but love this scheme for the 4th. gotta give this a try! I don't even know how it is that I came upon your blog, but I sure am glad! We are about to start a home remodel and I am in love with all the things you do here! There area unit several alternative router operations that area unit abundant easier and safer to try and do after you use the router during a table. One ideal is that if you would like to solely partly place a route one the sting of your work. Love seeing all of your ideas. 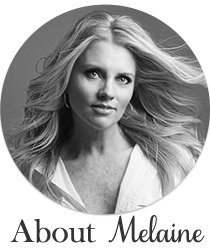 You are very inspiring.I'm your newest follower.Your blog is one I go to daily while I got free time.Its rally a very inspiring blog sites.